Five years ago, the sector was in the doldrums locally. But now it is adding new life-science firms at the rate of around 80 a year, according to a new report from state trade group Life Science Washington. In a quiet Bothell business park far from booming South Lake Union, players in the Northwest’s “other” tech sector are coping with growing pains of their own. At Fujifilm SonoSite, a manufacturer of portable ultrasound devices, demand is growing so rapidly that it recently decided to add a 10-person weekend shift to its assembly line. Yet that modest objective proved surprisingly challenging — in large part because SonoSite isn’t the only one looking to expand, as underscored by a new report from state trade group Life Science Washington. In Bothell alone, there are now 61 life-science companies — Seattle Genetics is right next door — with another 106 in Woodinville, Kirkland and Redmond, and many of them are also trying to quickly scale up. Even after SonoSite raised starting wages by as much as 15 percent, stepped up referral bonuses, and sent executives to recruit on local community colleges, so many of the company’s new hires were being poached by other employers that it took nearly a year of heavy overtime and backlogged orders before the company “had a stable workforce,” said Tom Davidson, director of manufacturing. SonoSite’s recruiting drama reflects the changing, paradoxical fortunes of the region’s entire life-sciences sector — a sprawling community made up of more than 1,000 medical-device makers, biotech firms, pharmaceutical companies, research organizations and others, and directly employing nearly 36,000 workers. Five years ago, the sector was in the doldrums. Hammered first by the recession and then by the uncertain economics of Obamacare, many firms struggled to attract new customers or investors, say those in the industry. A sector that had once been billed as an equal in promise to the region’s tech sector, thanks to its unique “synergies” between local tech expertise and world-class medical-research institutes like Fred Hutchinson Cancer Research Center, was stagnating. That dire outlook peaked in July 2014, when Amgen, then the region’s largest commercial biotech employer, said it would shutter its Seattle and Bothell facilities, eliminating 660 jobs and ending the legacy of Immunex, the biotech pioneer Amgen had acquired in 2002. Today, it’s a different story. According to Life Science Washington report, the local sector is booming once again, thanks to a roaring global economy, a health-care industry desperate for cost-saving innovation, and a new generation of products. These range from SonoSite’s compact ultrasound devices to a host of biotech breakthroughs from players like Seattle Genetics, Adaptive Biotechnologies, NanoString Technologies and Juno Therapeutics, which was recently acquired by Celgene for $9 billion. The sector is adding new life-science firms at the rate of around 80 a year, according to a survey by consultancy JLL. Hiring has picked back up. Capital and research grants are flowing in. In 2017, the Seattle area took in $577 million in venture capital and another $979 million in federal funding from the National Institutes of Health, according to JLL. The stakes for continued success are large. The average life-science employee in Washington made $93,146 in 2017, according to Life Science Washington. And, significantly, life-science firms are far less “bro” than is traditional tech: according to the trade group, half the state’s life-science workforce is female. Still, while the local tech realm is second only to the San Francisco Bay Area, the life-science sector here is a distant seventh behind national leader Boston, according to JLL’s survey. Other regions ahead of Seattle: the San Francisco area, San Diego, Raleigh-Durham, Philadelphia and the Washington, D.C., area. Scale is a big factor here. 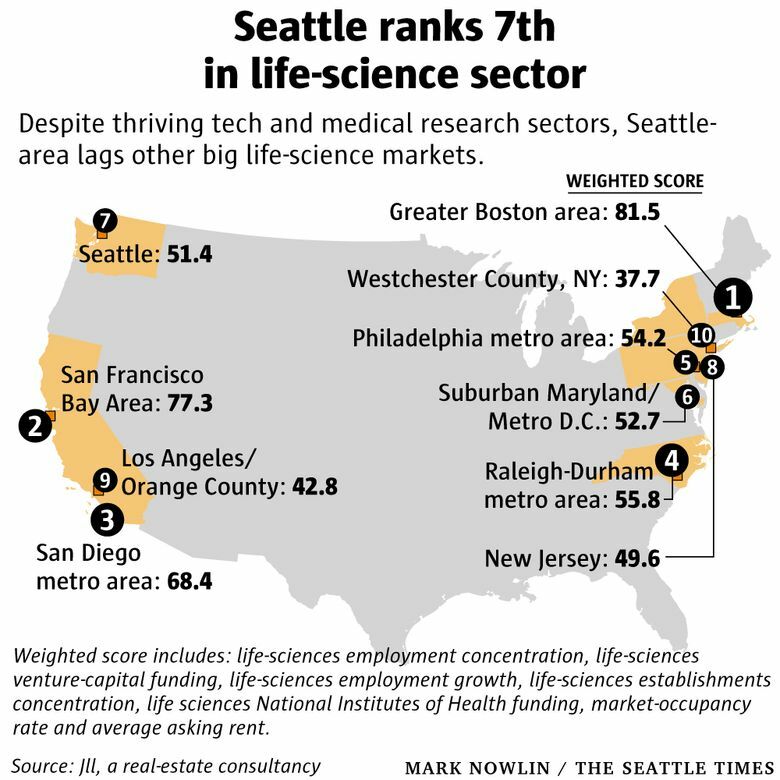 Boston’s life-science sector boasts more than three times as many workers as Seattle does, and twice the number of companies. That critical mass of employees and employers makes it easier for Boston life-science firms not only to hire locally from a larger talent pool, but to recruit nationally and globally: candidates know that even if their first job tanks, they’re likely to be able to find work at another company. By contrast, in Seattle, outside candidates worry “that if this company fails, I may be relocating back to where I came from,” said Brad Gray, CEO of NanoString Technologies, a South Lake Union-based maker of cancer-research tools. Size has its advantages in financing as well. Boston’s life-science firms pulled in seven times as much venture capital as did their Seattle counterparts, and much of that cash came from local venture-capital firms. In the Seattle area, even as hot companies like Juno Therapeutics and Adaptive Biotechnologies have raised hundreds of millions dollars, startups and smaller firms can still struggle to find financing and must often leave town to find it. Another difference between Seattle and the cities it hopes to rival: where life-science firms in places like Boston have benefited from strong government support, in the form of everything from tax credits for research and development to direct support for biotech-manufacturing capacity, firms in Washington now get far less direct public support. That wasn’t always the case: in 2005, state lawmakers created the Life Science Discovery Fund, funded with money from the tobacco settlement, which helped support some 40 startups, including Adaptive Biotechnologies, and was credited with helping add 3,500 jobs. But in 2015, the program lost support in the Legislature and, after years of dwindling budgets, was defunded in 2015. “Instead of investing more as the industry was developing, it was shutting down,” said Leslie Alexandre, president of Life Science Washington. Alexandre, Gray, and other industry officials are part of an effort to lobby state lawmakers to resume support. But they’re also working to address the sector’s bigger need — a chronic labor shortage — by coordinating with regional universities and community colleges to start expanding the local talent pool. It’s a critical issue across the life-science sector, Alexandre said, but it’s especially urgent for companies that are trying to commercialize their ideas and move from research and development to manufacturing and marketing — and who, desperate for talent, may consider another location entirely. In an earlier version of this article, the name Fujifilm SonoSite was misspelled and the photo caption omitted the full title of Rich Fabian, its president and chief operating officer.